As the summer marches on we find ourselves into August and the Yateley 10k Road Race Series is sadly over for another year. The final race on Wednesday saw dramatically different conditions to the previous event with rain keeping temperatures down and whilst this wasn’t ideal for spectators, other than a headwind in the opening and closing kilometres the conditions were more conducive to running. Well done to everyone and congratulations to the following who achieved personal bests on the night:- Jacqueline Hudson, Nicola Gater, Sharon Burfield, Helen Fairman, Claire Rowse, Amy Gates, Julie Graham and James Ward. Special mention to all the marshals and especially the Reading Road crew who cheered us along that tough section. Finally to wrap up on the Yateley races club members achieved some great results in the overall series. Dave O’Toole took the overall victory in the M60 category and I finished second overall in the M40 age group. Well done to everyone who completed all three events, you’ll all be enjoying the fantastic combo medals which build up into a great trophy. I’ve written before about being blown away by Leon Hicks’ astonishing feats of endurance and somehow last week he took it to another level with five marathons in a week. Having a completed Enigma’s ‘Planes’ marathon on Sunday 30th July, Leon’s running week started on Tuesday in in Kent at SVN’s ‘Very British Challenge’. Next up on Thursday morning was Enigma Running’s ‘School’s Out’ where Leon completed ‘Marathon 2’ where he completed laps of the course at Caldecotte near Milton Keynes in a clockwise direction. Then in the afternoon he headed back in an anti-clockwise direction in ‘Marathon 3’ to complete the double. On Saturday at the Phoenix Summer Marathon Leon finish in 4:59:08 to go sub-5 after an incredible week and 131 miles. Leon is back in action this week with a paltry (!?!) four marathons to complete his 52 marathons in 52 weeks challenge. We’ll have more reports to follow and an update in next week’s Run Down. Frimley Lodge Parkrun was closed this week so many members made the short sprints over to Rushmoor and Bracknell. The closure in combination with holiday season meant this week was the most prolific in terms of Parkrun tourism. Rushmoor saw one of its busiest ever mornings as 589 runners descended on the Queen’s Parade course. Ten members toed a very busy startline with Stuart Mayes the first SJ to finish in 22:31. 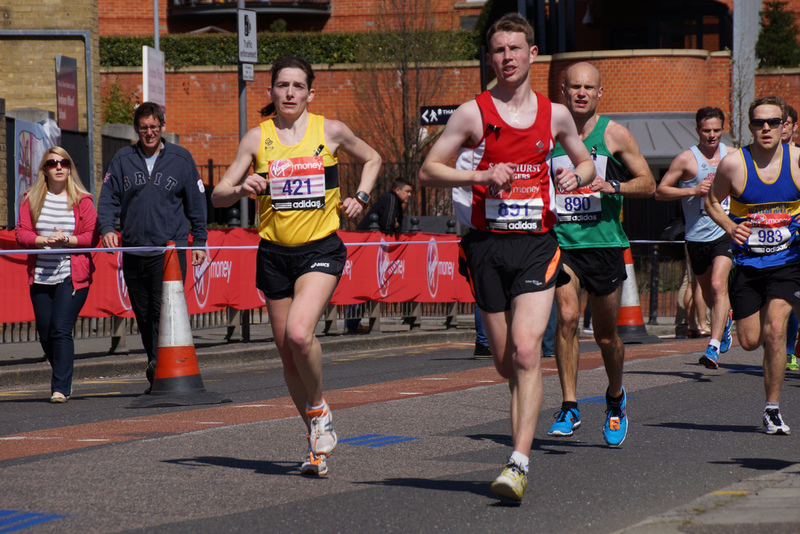 Royston Crandley recorded a new course PB of 23:43 as did Jane Bannister with 27:43 and Chris Brooks in 37:02. Fredric Frennessen scored a fastest ever Parkrun with 25:44 as did Michelle Williams in 40:19. Over at Bracknell and back on the ‘new’ twisty course, twelve Sandhurst Joggers tackled the event with Dave O’Toole first member to finish in 24:38 in his first run at the venue closely followed three seconds later by George Green. Sophie Le Saux posted a new Bracknell PB of 29:17 which is also her fastest this year. An abundance of Parkrun tourism this week with Stuart Overhill in action at Bedfont Lakes near Healthrow finishing in 22:49. Janet Venables ran 28:23 at Lloyd Park, Croydon. Dave Ayling stopped the clock at 20:56 on the Greenham Common course near Newbury. John Tovell ran well at home venue Crane Park while Lisa Hale ran strongly at Homewood. Richard Boese sampled the Upton Court course near Slough. Philippa Francis made her second appearance at Evesham in as many weeks and bettered her time. Nigel Evans made the longest trip up to Perth in Scotland and was rewarded with his quickest time in two years finishing in 23:08. More South Downs action at the Harting Multi Terrain 10 mile race near Petersfield where Ian Watson finished in 1:24:54 for a top half finish and Gavin Loader came home 6th in 1:04:08. No surprises who our King of Strava was last week with 209.6km thanks to running four marathons; Leon Hicks took the title my (literally) miles! Fellow marathoner Richard Boese took second with 74.9km and I was third with 66km (thankfully without having to run a marathon!) Sixty-four members logged runs this week. To take part in this just create a free Strava account and link it to the club in your profile. Tuesday: There will be multiple groups running on Tuesday from Sandhurst Memorial Park this week starting at 6:30pm. Later the interval sessions will meet at The TYTHINGS in Yateley at 8pm where the session will be 12 x 2 minutes with 1 minute recoveries. Wednesday: It’s the second Wednesday of the month so time for the Handicap for members to track their fitness progress and establish a benchmark. This four mile run over a two lap course around Crowthorne is ideal for all abilities and starts from the Morgan Rec in Crowthorne at 7:30pm. It’s still tight in the annual competition but with only five 2017 runs remaining don’t miss out on a chance to score points! All members are welcome at the post run curry at The Raj in Sandhurst.